Happy Three Clover Thursday! This week Kerry issued Birds or Bugs as our theme. I don't own that many stamp with bugs or birds, and need to get working on my Christmas cards, so I decided to use Stampin' Up! 's A Cardinal Christmas. The image is stamped in Black on Watercolor paper, then colored using the Marker Watercolor Technique, cut with Spellbinders Oval Die. I layered the stamped panel onto a Black Oval panel, then used the Torn Frames Technique to add some distressing. I added Rock Candy Stickles to the Snowflakes and the Berries on the branches. Thanks for stopping by, for more inspiration - click on the Three Clovers Logo on my sidebar to see what Kerry and the other Challenge Team members created today. WOW, WOW, WOW!!!! Lisa this card is GORGEOUS! hugs! 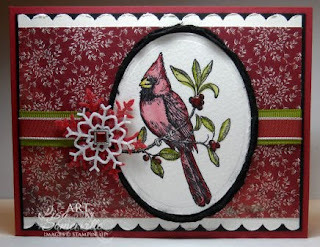 Very pretty card, love the cardinal with the scallop borders. Oh ... this is just beautiful! Thanks for sharing! Wow is right! Love your card, it is just gorgeous and we both were thinking alike on this one.Love the distressing you used and oh everything about this card. By the way your stamp set is, A Christmas Cardinal. The one I used is the retired Cardinal Christmas. This is stunning Lisa! Love the papers too! Pretty, Stickles, lol, imagine that! They did add a lot to the detail! So very beautiful and rich! Lovely...I haven't watercolored in ages and it is my favorite coloring look. Wonderful, rich colors!